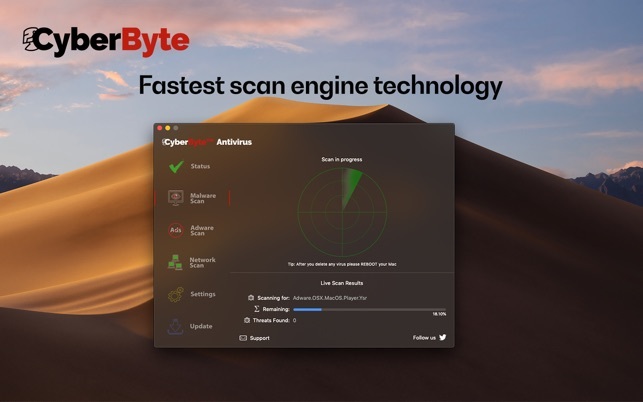 Antivirus CyberByte™ has the most efficient and fast scanning engine with one of the highest detection rates in the market. 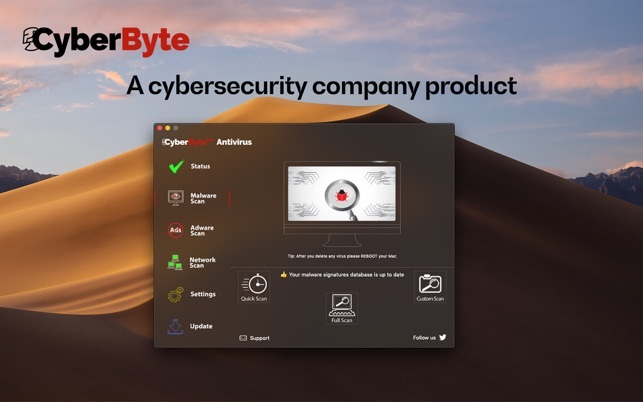 Antivirus CyberByte™ is the absolute protection for your Mac against malware, adware, viruses, popups and unwanted ads. 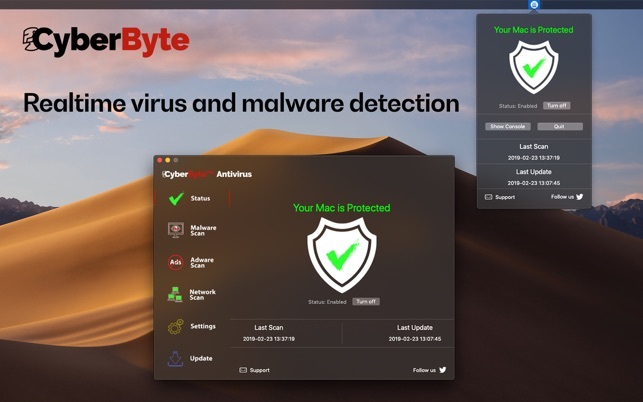 We, at CyberByte™, besides our security consultancy expertise, we study the malware evolution, and we had observed that there had been a 120% increase in Mac malware. This is the reason why we had developed the Antivirus CyberByte™. Our designers created a piece of art, with Easy-to-Use and Native interface design in mind. 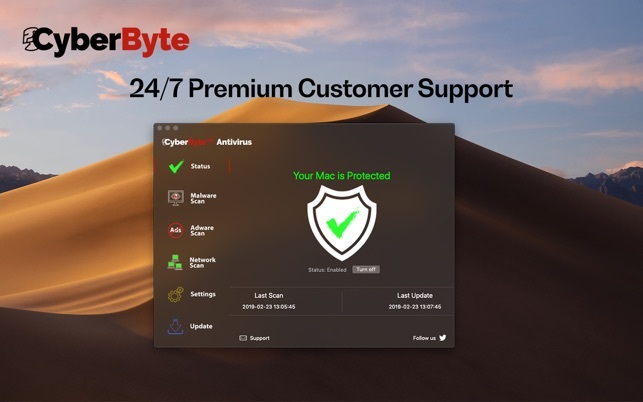 While is so easy to use, even for an inexperienced end user, it will offer its full power to identify and crush any malware or adware found in your system. 3. The active monitor protection, which is continuously monitoring your Downloads and Applications folder, to identify if malware or adware will sneak in there. The power of any antivirus comes from its malware pattern database. A malware pattern database is a file that contains the signatures of malware that the antivirus can identify. A poor database means poor detection. The scanning speed is also an essential element. Slow scan speed means the time to complete a full scan is longer, and your Mac resources are used at maximum. The network mapping tool is a masterpiece that is useful when you are connected to your home wireless network. At last, even if your antivirus software has a good database, it is useless if it does not have Active Protection. This feature is crucial because it is continuously monitoring your Downloads and Applications folder - this is the place where your Internet browser is downloading any file. If a potentially malicious file is downloaded, it will be identified by the Active Protection module and will report back to you. CyberByte™ development team thanks you for your attention. We thank you all for support and feedback. Please continue to e-mail us at support@cyberbyte.org with your thoughts and suggestions to improve the application. We love to hear your suggestions! I've had an Apple computer for decades now... and recently experienced my first virus. I had a really annoying piece of malware on my iMac that I tried getting rid of manually with no success so I downloded this app and it took care of the problem. 1) When I got the notification that the free trial was over and it asked me to pay to continue using the app the notification didn't mention the time frame that would be covered! (It turns out to be for a full year). I feel the cost is reasonable for a year. If it had been for a month I would have been really annoyed. 3) After running this repeatedly I still have one Browser extension (TapuFind) that pops up each time I launch my browser. I was hoping this would clean up that little problem as well. So far it has not. The app nags me to rate the prodiuct (via a pop up window) every time I run a scan. This is an unwanted annoyance. Doesn't the developer realize that is the kind of expereince we are trying to avoid by running an anti-virus software? That said, overall I'm pretty happy with this app. My MacBook Pro is six years old. It has the latest IOS update, but it was terribly slow. I was concerned that it might have some sort of virus in it since I did visit some not-so-safe-sites, so I downloaded this app and got to work straight away. The app is super easy to use and it works at a fast rate. The scan did take an hour and a half, but it scanned through all of my (approximate) 270,000 files on my Mac. The app detected a single malware, so I deleted it and saw immediate results. My laptop was so fast, it was as if it were rejuvenated! I’m so thankful for this free, excellent service. I’ll be sure to use it again if I see my Mac acting up again. It has a nice interface and found a bit of malware a previous antivirus program missed. I thought there was a problem but I was carelessly reading the message that the updates had been successfully applied as “had not been successfully applied.” Their spport staff was great. They responded to my e-mails very quickly and were polite in the face of my faulty reading. I also had to contact them because I couldn’t see how to manually remove a hidden file. They got right back to me with complete and accurate directions. The program works as described and the support staff is great!